The ultimate to guide to scaling your Facebook Messenger Ads for success. In the world of social media advertising, Facebook is definitely the overall reigning champ. Almost every type of customer is on Facebook. But, there’s a part of Facebook that has an even higher concentration of users than the platform itself: Facebook Messenger. Overall, messaging apps now have more users than social networks. Facebook Messenger alone has 1.3 billion monthly users. So it makes sense that Facebook designed ads specifically for its messaging app. Given the massive potential for reaching customers and starting conversations, you should be using Facebook Messenger Ads. But watch out. Messenger ads have a few gotchas that standard Facebook ads don’t. We created this guide to walk you through some of the do’s and don’ts of Facebook Messenger ads and cover some of the basics of setting them up. But first, some Facebook Messenger Ad basics. Click-To-Messenger Ads. These are ads that appear on the user’s timeline and look the same as standard Facebook image, video or carousel ads. However, the call to action button takes users to a conversation with your company in their messenger app. Messenger Ads. These are ads that appear in the messenger app itself. They can either start a conversation or take users to a landing page. Sponsored Messages. These are ads that look exactly like a normal message. The company name on your Facebook page will be displayed as the sender. These ads are designed to start a messenger conversation. Home Screen Ads. These ads appear between messages on a user’s messenger home screen. Home Screen Ads are essentially standard Facebook ads that display in the messenger app. These ads take users to a landing page. Each ad type works for accomplishing certain objectives. Here’s what you need to know to get the most from your Facebook Messenger Ads. 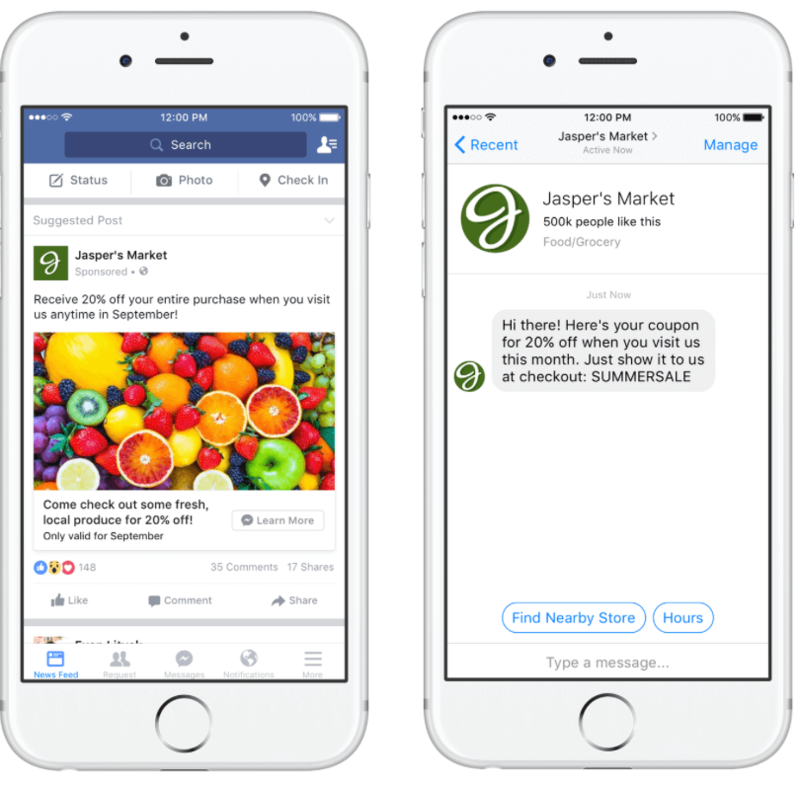 Click-To-Messenger Ads are a great way to build your base of Facebook Messenger subscribers. In Messenger, subscribers are simply people who have messaged you in the past and haven’t deleted the conversation. Having a conversation with a customer in Messenger gives you an additional channel to communicate with them and offers an opportunity for hyperpersonal interaction. Additionally, you can broadcast messages to your entire subscriber base with Messenger marketing software. So Messenger can act as a pseudo email list. 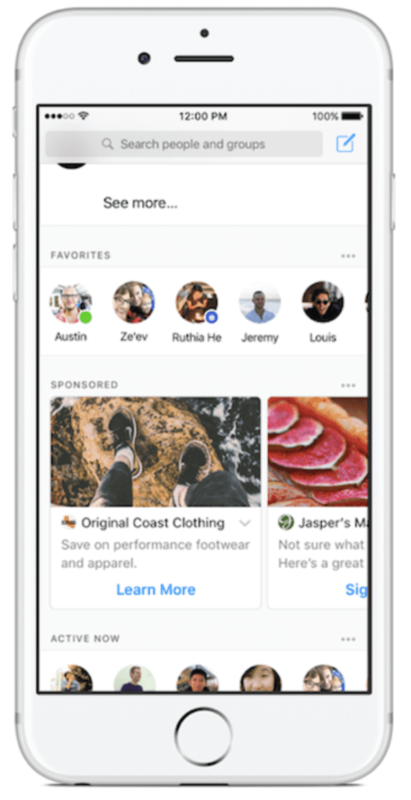 Click-To-Messenger Ads work in both Facebook and Instagram, and on desktop and mobile. You can use the same targeting as any other Facebook ads. Target behaviors, interests, custom audiences or anything else you can target in the Facebook Ads Manager. Click-To-Messenger Ads are only available for Facebook campaigns with traffic, messages or conversion objectives. You can’t create Click-To-Messenger Ads in campaigns with other objectives, so you won’t see them in the drop-down menu. Those are the basics. Now that you’ve got your feet wet, here are some best practices for running Click-To-Messenger Ads. Make sure users understand what they’re clicking. Since Click-To-Messenger Ads look like standard Facebook ads, it’s easy for a user to click on the ad expecting a landing page to come up. When a person clicks expecting one thing and gets another, that’s a bad user experience and could hurt conversions. So use a call to action like, “Start a Conversation” or “Ask Us Anything,” and clarify in the ad copy that they’re clicking through to Facebook Messenger. That way customers know what to expect when they click on your ads. Use Click-To-Messenger Ads for remarketing. If a prospect has visited your page or messaged you, but hasn’t made a purchase, there’s a reason. Often this barrier to buying is a lack of information or understanding. So use Click-To-Messenger Ads as an opportunity to find out what questions or concerns a potential customer has about buying and clarify things for them. Also, if you use Click-To-Messenger Ads for remarketing, you’ll get better results if you use other marketing channels to build your subscriber list. Include a link to start a Facebook Messenger conversation in your marketing emails and customer service emails to encourage people to message you. Ask a question people can answer. This works best if you’re targeting people who haven’t interacted with your brand before. However, it’s totally viable for renewing a conversation with prospects who haven’t contacted you in a while. The big thing here is to ensure that you ask a question that leads to a sales conversation. Unlike an Instagram poll, which can be solely entertaining, questions in your Click-to-Messenger Ads should help customers express their needs and pain points to you so you can present a solution (your product). Use Click-To-Messenger Ads for traffic and messages objectives. Yes, conversions are the end goal of all advertising. However, until you have a significant number of conversions, Facebook doesn’t have enough data to optimize your ads. This usually means they won’t get shown to enough people to be effective. Those are the ins and outs of Click-To-Messenger Ads. Remember that many of the fundamentals of standard Facebook ads apply to Click-To-Messenger Ads, since they look and function very similarly. We’ll start with the simpler of the two types of Messenger Ads: Home Screen Ads. Home Screen Ads are more of a new placement than a new type of ad. Basically, Home Screen Ads are just standard Facebook ads that show in a user’s messenger app. The same best practices of Facebook ads apply to Home Screen Ads. However, there are a couple of additional considerations. Let people stay in Messenger. Unlike the Facebook timeline, people don’t idly cruise their messages. People open messenger to send messages. So they’ll be irritated if your ad takes them to their browser. Stick with ads that show content in Messenger when a user clicks on them. Use static, understated ads. It’s best to create ads specifically for showing in messenger, rather than just importing your timeline ads. Keep your ads simple and subtle. Avoid flashy ads that feel like they try too hard to get attention. Messenger is a very different environment than the timeline. It’s very easy for users to tell Facebook that your ads are not useful to them, which could reduce your ad showing. That’s it for Home Screen Ads. Simple, right? Let’s talk about Promoted Messages. Promoted Messages have the same look as messages from friends. But they’re from your brand. Promoted Messages are only available for campaigns with the messages objective. If you select a different objective for a campaign, Promoted Messages won’t appear in the “Ad Type” menu. You can send Promoted Messages any time. Ordinarily, you can only send messages within 24 hours of the last message they sent you. You can only send messages to people who have messaged you in the past. This is pretty self-explanatory. People who have unsubscribed or deleted your conversation cannot be contacted with Promoted Messages. Promoted Messages aren’t delivered immediately. Facebook says that your messages will be delivered 3-5 days after your campaign starts. Facebook automatically sends messages when people are most likely to see them based on how they use their messenger app. Facebook recommends that you run a Promoted Messages campaign for at least seven days to ensure that all your messages get delivered. You can only send one message to each person. If you’d like to send more than one message per customer, you’ll have to create multiple ad sets. Keep in mind that it’s easy to irritate customers with too many messages. Keep the message volume reasonable. Facebook charges for impressions. You’re going to get charged whether the user opens the message or not. Keep this in mind as you plan your budget. Right now, the average cost of Promoted Messages is $30 per 1000 impressions. There’s quite a bit there. Fortunately, the Facebook Ads Manager takes care of most of the important stuff. The list of best practices for Promoted Ads is much shorter. Since you can only send Promoted Messages to people who’ve already contacted you, these ads are exclusively remarketing ads. Use Promoted Messages for promoting events, sales or offering discounts. Since these customers have already messaged you, it’s pretty likely that they already have all the information they need to make a buying decision. They likely just need a little nudge. Price reductions go a long way here. Target specific segments of your subscriber list. Just like email marketing, Promoted Messages work better when they’re more relevant. Facebook lets you get very granular with your segmentation and targeting, so take advantage of it. That’s all there is to it. Easier than it looked at first, right? We’ve got one last thing to cover. Facebook Messenger Ads can be created in the Facebook Ads Manager, using any campaign with traffic, messages or conversion objectives. Creating Facebook Messenger Ads is similar to creating other ad types, so we’ll cover this quickly. Go to Ad Creation and select “Traffic,” “Messages,” or “Conversions” as your objective. If you want to create Promoted Messages, select the “Messages” objective. Select the ad type you want to create. Specify your audience. By default, ads will be shown to everyone. You can choose audiences you’ve already built or select a new audience based on Facebook’s segmentation factors. For Click-To-Messenger Ads, select the “Home” placement. For Home Screen Ads, select the “Messenger” placement. Specify your budget and schedule. Build your ads. You can specify your text and images for all messenger ads. You can also customize customer actions like providing suggested quick replies. And one last thing: consider using a Facebook chatbot to help you out. Message volume can get unmanageable fast. A chatbot can do a lot of work in dealing with common questions and issues. 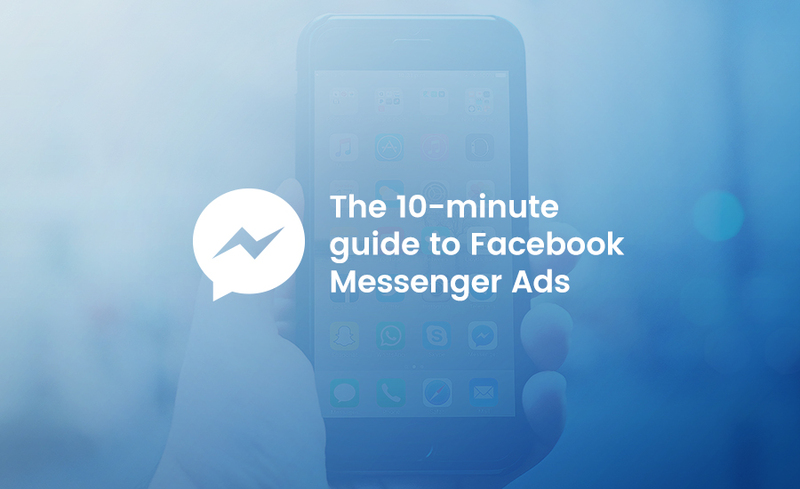 That’s it for our 10-minute rundown of Facebook Messenger Ads. So have a go at using Facebook Messenger Ads in your business. As always, measure, test and iterate. Then send us a message and let us know how these ads work for you!